The Israeli government asked the Palestinian Authority if it would take control of the Gaza Strip in the lead-up to Operation Cast Lead. Hamas will accept a negotiated peace based upon the 1967 borders, although not publicly. And the U.S. government is seeking information on foreign funding of terrorism—in particular from Venezuela and Turkey. All of this is according to leaked State Department documents posted Sunday on the Wikileaks site. The State reports leaked by Wikileaks shed new light onto the past and ongoing delicate negotiations that the U.S. government has undertaken to reach a peace agreement between Israelis and Palestinians. The classified documents, which span four years and the most recent two American administrations, reveal increasing American and Israeli cooperation with Arab states, a greater focus on isolating Hamas, and the intricacies of intelligence collection against Hamas in the Gaza Strip. The documents, many of which summarize meetings between foreign government officials and American diplomats and members of Congress, indicate that there is more interest in a two-state solution between Israel and Palestinians than at any time in recent history. In one report, issued on the heels of the 2007 Annapolis Conference, the head of Egypt's Security Service, Omar Soliman, told the U.S. ambassador to Cairo and a visiting congressional delegation that there was broad-based support for a negotiated peace and the creation of a Palestinian state within one to three years. Believing that such a peaceful resolution would be a "big blow" to terrorist organizations that use the conflict as a pretext for violence, Soliman enumerated the conditions that would make peace possible: a moderate PA leadership willing to negotiate; an isolated and politically cut-off Hamas; an Israeli government ready for peace; and Arab states ready to see an end to "the struggle." Hamas boycotted the Annapolis peace negotiations, and protests erupted in both the Gaza Strip and the West Bank. Despite that, Soliman went on to applaud the Bush Administration's efforts at Annapolis. "The bottom line for Hamas is that they must be forced to choose between remaining a resistance movement or joining the political process," Soliman reportedly told U.S. officials. "They cannot have it both ways." The conference, Soliman reported, gave new hope to the peace process. "We have a short time to reach peace. We need it. We need to wake up in the morning with no news of terrorism, no explosions, and no news of more deaths. We want everyone happy. That is the Egyptian dream." The conference ultimately failed to achieve the peace settlement that participants had hoped for, but the U.S. continues to pursue it. During a February 2010 meeting between Emir Hamad bin Khalifa al-Thani of Qatar and U.S. Sen. John Kerry, the Massachusetts Democrat who chairs the Senate Foreign Relations Committee, the men discussed recent administration efforts to move forward with Israeli-Palestinian peace. In a wide-ranging conversation, the men discussed border negotiations, the right of return, parallel peace efforts with Syria, the demilitarization of an eventual Palestinian state, and Jerusalem, among other topics. Emir al-Thani argued that the best way to move forward on peace between Israel and the Palestinians was for the Americans to push Israel to make peace with Syria. This, al-Thani argued, "would help push Arab extremists," the leaked documents show. Referencing the 2006 war between Hizballah and Israel and 2008 Operation Cast Lead, the emir said what has changed is that Arabs "for sure" now want two states—Israel and Palestine. "When you consider that many in the region perceive that Hizballah drove Israel out of Lebanon and Hamas kicked them (at least initially) out of the small piece of land called Gaza, it is actually surprising that the Israelis still want peace." Despite that, al-Thani said he believed the moment is ripe for successful peace negotiations. Israelis, who "have been under threat for a long time," are ready for peace. And "Hamas will accept the 1967 borders with Israel, but will not say it publicly so as to lose popular Palestinian support." The only remaining question involved the authority and resolve of Palestinian Authority President Mahmoud Abbas. Kerry and al-Thani agreed Abbas "is not strong enough to make necessary compromises with Israel because the Palestinian people have wanted him to stick to his guns on a settlement freeze and the Goldstone Report." The Report, which was critical of Israel's actions during Operation Cast Lead, has been widely criticized as one-sided and inaccurate. U.S. officials are looking beyond Abbas' political abilities to the internal politics of all Palestinian reconciliation efforts, the documents show. 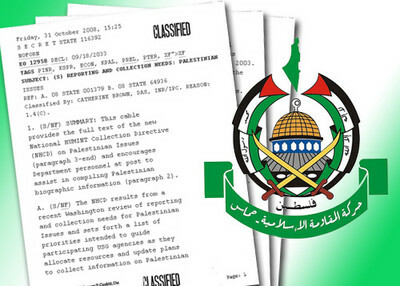 For example, an October 2008 cable detailed State's efforts to collect intelligence on Palestinian issues. The directive sought to have diplomats collect information on officials within Hamas and the Palestinian Authority, including phone numbers, email addresses, credit card account numbers, frequent flyer account numbers, work schedules, and "other relevant biographical information." While largely interested in official and public perceptions on issues relevant to ongoing peace negotiations, including final status issues and the U.S. role in the peace process, the directive highlighted a number of areas of interest for the global fight against terrorism. Of particular note was the source of funding for Hamas and the organization's potential for cooperation with other terrorist groups. American officials sought information on how Hamas has raised and moved money, including "contacts and cooperation between NGOs and terrorist groups, especially Hamas charities and any political/humanitarian entities suspected of passing funds to militants." Highlighting the threat posed by abuse of Islamic charities, the directive requested "details on Hamas' social welfare network to include hospitals, education systems, textbooks, libraries, and social services in the Palestinian territories and their funding sources in the region and worldwide." The directive also asked that diplomats discern whether there is any "relationship between Palestinian terrorist groups and al-Qaida, and indications of interest by Palestinian terrorist groups to work with global jihadists."